The game requires between five and ten players. Approximately one third of the players are randomly chosen as spies; the rest are members of the Resistance. The spies know who the other spies are, but Resistance members do not. The game consists of up to five missions. Each mission has a leader. The leader proposes a mission team of a certain size, which the group approves by public vote. If the group does not approve the mission by a simple majority, leadership passes to the next player. If the group cannot approve a mission team after five attempts, the spies win. Once a mission team is chosen, it votes by secret ballot whether the mission succeeds or fails. Resistance members will always vote for success, but spies have the option of voting for success or failure. It usually only takes one spy on the mission team to sabotage a mission, but sometimes the fourth mission requires two. If three missions succeed, the Resistance wins. If three fail, the spies win. You are allowed to say anything, to any one, at any time -- as long as it is said publicly. Original Resistance: At the beginning of the first round of every mission, the leader distributes a number of plot cards from a shuffled deck to other players. These plot cards can be used to reveal additional pieces of information to certain players or to the entire group. 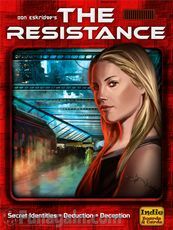 Resistance: Avalon: One of the Resistance players (designated "Merlin") is told who the spies are. He can use this knowledge to help his teammates, but beware -- the spies musn't figure out who Merlin is! At the end of the game, one of the spies (designated "the Assassin") is allowed to kill off one Resistance player; if he picks Merlin, the spies win!